Storms forecast for Sunday and Monday are likely to disrupt if not cancel Western Channel and Dover Strait ferry services. North Sea services look to be unaffected so far. Channel delays: A technical problem on Pont Aven and bad weather affects most Brittany Ferries‘ services until Monday. Bad weather disrupts Condor Ferries services on Sunday and Monday. Weather alerts: No Red or Amber alerts. Yellow alert for high winds Germany. Weather: Wind and rain in northern Europe, fine throughout the Mediterranean. Having cycled in the Netherlands we know the dedicated infrastructure over there isn’t always quite as wonderful as some in the UK like to believe. 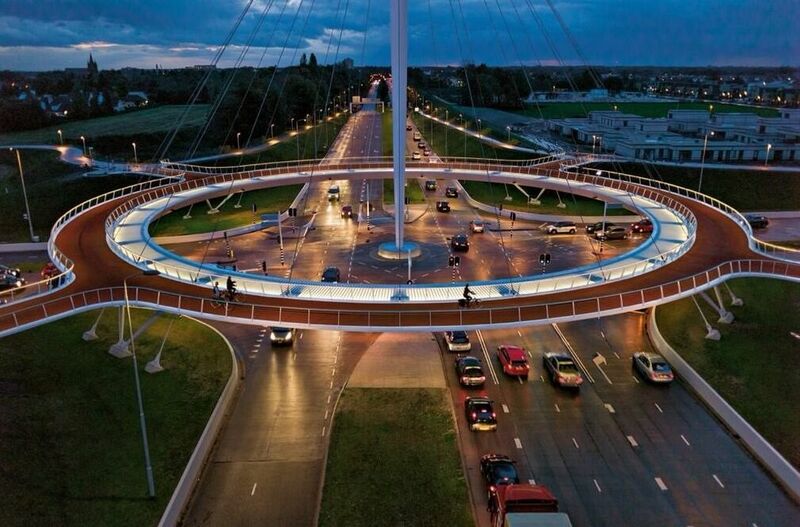 This floating cycle roundabout however – the Hovenring at Veldhoven, just west of Eindhoven – certainly is. Photo via @jpaudouy. Did you know, by the way, that cyclists in the Netherlands can be fined €50 for riding without lights, and another €35 for not having proper reflectors? The authorities kicked off a new awareness campaign this week. ← Light, camera, action. Top prize for ferry photograph.